The first soft gentle snow of winter is always a wonder to behold. It marks the passing of the seasons, and here in the mid-Atlantic region often suggests that the holidays are approaching fast. By February, however, only those who love winter — The Legal Genealogist most definitively not among them – look on winter weather as anything other than lasting too long and not ending nearly soon enough. By February, we’re all hunkered down, tired of gray skies, tired of ice, tired of snow, and desperately looking for some color and warmth in our lives. By February, at a minimum, we’re all looking for comfort food. In the house where I grew up, comfort food was made in bulk. Having roughly a kazillion brothers and sisters inevitably meant that comfort food was prepared in the largest pot or pan in the kitchen. Chilis and other bean dishes. But every so often something a little special — a little out of the ordinary. Sometimes the little-out-of-the ordinary didn’t work so well. One of our comfort dishes was simply called tuna noodles. It’s about the easiest thing in the world to make — it’s simply a sauce of cream of mushroom soup, milk, and tuna over egg noodles. We all loved it. Until the day my mother decided her children weren’t eating enough green vegetables. And she laced the tuna noodles with peas. And then promptly had the pleasure of sitting there at dinner watching each of her many children carefully and methodically picking the peas out of the tuna noodles and moving them to the side of the plate where we stayed while we ate the tuna noodles. She didn’t do that again. But then there were things a little out of the ordinary that worked amazingly well. She was an absolute whiz at making homemade pizza. She made her own dough, she made her own sauce. The only problem was having enough oven space to make enough pizzas to feed all those hungry children, not to mention the two adults in the household. It was always a treat if you managed to score a slice of the first pizza out of the oven, rather than having to wait for the last pizza out of the oven. Winter lunches were an every day thing. We lived close enough to the elementary school to walk home for lunch and our daily comfort food was always soup. Generally Campbell soup out of the can — vegetable beef, chicken noodle, one of my siblings even liked bean with bacon — but sometimes we’d get something a little out of the ordinary. A soup made from a Lipton mix (“is it soup yet”) and sometimes even homemade soup. Sandwiches to go along with the soup were usually just bologna or liverwurst — something I never learned to like — but every so often something a little out of the ordinary: scrambled egg sandwiches with crumbled bacon. And then there were the best of all. Fried sandwiches richly buttered on the outside and the inside filled with melted gooey goodness. No, not cheese. Not in our household. Cheese in our household meant smelly German cheese or Velveeta. No, the insides of these fried sandwiches were much better than smelly cheese or fake cheese. Our comfort food was fried peanut butter sandwiches. Some of us liked the smooth peanut butter. Some of us liked the extra chunky. Some of us liked it on plain white bread. Some of us wanted a sturdier grain. But all of us — all of us without exception — all of us loved the melted gooey goodness of fried peanut butter sandwiches. So here we are, again, in February on another gray day without color or warmth. Winter has been going on forever. It seems that it will continue forever. We all need a little comfort in our lives this great February day. 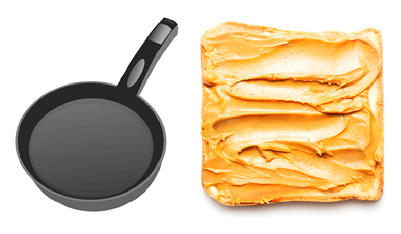 I don’t know about you — but I think I’ll make a fried peanut butter sandwich. What’s your comfort food for the grays of February? Fried egg sandwiches. My father like liverwurst. We had peanut butter and bologna sandwiches for lunch. Pretty mundane stuff in the 1950s. I think I had a bologna sandwich almost every day from 1950 to 1965. My mom was limited in variety, but it was always there in our lunch bags. We had bologna often enough as kids that I absolutely refuse to eat it as an adult. Lebanon bologna yes, plain bologna no no no. Living in the Pacific NW for the past 40 some years, I rely on a hearty bowl of cream of tomato soup along with a grilled cheese sandwich to get me thru those grey and gloomy February days! Growing up my favorite comfort food is still my favorite comfort food. Cream of Tomato soup and grilled cheese sandwiches! Now the cheese could be anything except the fake one. Extra sharp cheddar is really best, though. 🙂 Mom was raised by a dad that worked for a dairy. Fake would have not even been a consideration. In late summer, we freeze tons of tomato soup and tomatoes, so homemade tomato soup is almost instant! I agree with the no bologna, if I never taste, smell, or look at it again, that would be awesome! I don’t think I ever had real cheddar cheese until I left home. The only cheese my mother typically used (other than on pizza) was Velveeta. And my German-born father liked Limburger. Bleah. Scalloped potatoes: good hearty midwinter comfort food that reminds me of my family when I was growing up in southern Oregon. Just about to make a batch. Spaghetti and red sauce. Poached eggs on milk toast. Canned fruit with dumplings. PIE! Any kind. Extended family in the foothills each fall gathering at grandma’s house, assembly line canning produce for the coming year, enough for everyone: thus those pies and desserts in the depths of winter. Habits die hard. Wish my family had done more canning for pies in the winter! I’ve been eating a lot of soup lately. Chili. I need to make a pot of chili. My mom made the best spaghetti, chili, biscuits. Boy, could she make biscuits. My brother inherited the biscuit mojo en toto. Were I going to do it these days, I’d have to go gluten free on the biscuits. My mom would take the last dough that she didn’t roll out into biscuits and make what we called “cinnamon pies.” She’d fill them with butter, sugar, and cinnamon, and then bake them. After the oven quit working, she made biscuits in an electric skillet. Those cinnamon pies. There has not been anything like them, especially when the cinnamon leaked out of the dough and burned a little onto the bottom. Wonderful. Thanks for the reminders. Cinnamon fried pies. Elizabeth Ballard’s Mother baked them, my Mother fried them. Ummmmmmm yummy. Same recipe, butter, sugar and cinnamon inside the dough. After frying and still hot, then they would be tossed in a sugar and cinnamon mix on the outside…I can almost smell them. Liverwurst was one of the “variety meats'” available during rationing of WW2 so was bacon and Peanut Butter. I have suggested sandwiches for those workers needing to carry meals and it included various PB sandwiches. SO post War, the families were probably still making the same. I make Fried PB for my greats and grands when they visit as a treat. After reading this yesterday, my husband and I decided we needed the comfort of tuna casserole – made with peas because, after all, we’re adults and know we need vegetables. It’s still one of our favorites, especially on Fridays in Lent. I never heard of fried peanut butter sandwiches, but my husband can’t wait to try one. Thanks for making us laugh! Being a snowbird is sounding better and better each year. Is it wrong to envy the deep snow of February? We moved to New Mexico last year to be closer to family (read: grandkids), after decades of Colorado and Idaho. I MISS snow! Terribly. Everytime a cloudy sky happens – like once or twice a month, I feel like doing a snow dance! We both thought it would be grand to live where there is no snow. Now we find ourselves telling each other “oh goody, another perfect sky” ha. We are traveling north next month and can hardly wait!